Nicely upgraded 1-BR, 1-bath condo. 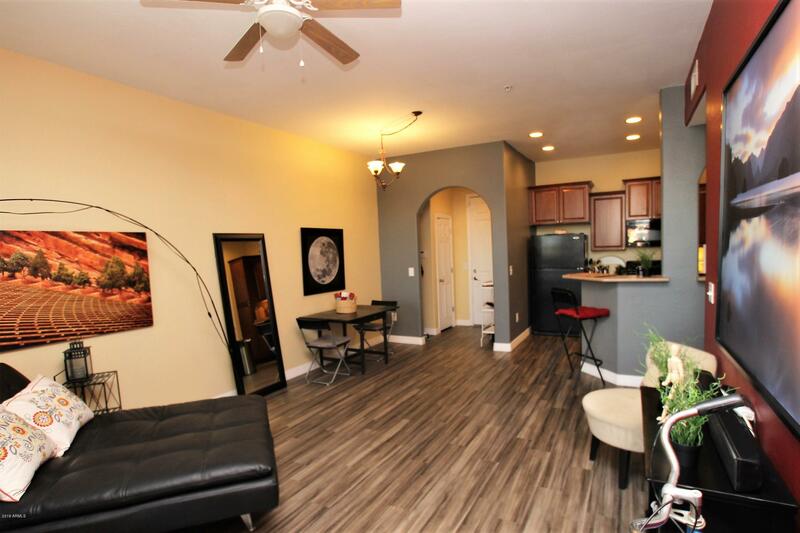 Easy access by elevator to this 2nd floor unit with open floorplan, gorgeous vinyl plank floors, 4'' trim, tiled tub surround, custom paint and more! Enjoy efficiency, privacy and security as you soak in the winter sunsets over the White Tank Mountains, or pull down the new sun shade in the summer. Plenty of space for guests with a layout that allows for private entry into the bath and patio. Any or all of the furnishings available for purchase! The Park Place community features a heated pool, spa, fitness center, theater room, library, business center, exercise path & clubhouse for you to reserve complete with a full kitchen, seating, & pool table. Convenient to shopping, restaurants, entertainment, medical & much more. Come make this your new home!